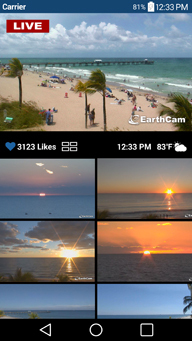 With EarthCam's Webcams app, you can travel the globe, visiting scenic and landmark destinations via our unique network of live HD streaming video and megapixel snap shot cameras. Explore the Hall of Fame to enjoy the best image archives submitted by the EarthCam.com visitors and share your favorites via Facebook, Twitter, Instagram, and email. Have a favorite location you like to visit? Create a personalized list of favorite webcams for a customized experience. You can purchase a specific set of webcams or you can buy them all for an all-access virtual passport. Please note that actual cameras listed in each package are subject to camera availability and performance, and may change from time to time. New cameras are added regularly, so be sure to check back for new releases. Enjoy!